Midtown Medical Imaging will do everything possible to make you feel calm and comfortable during your time with us. You are welcome to tour the location and meet the staff before your appointment. Just give us a call. A registered technologist will explain the entire process before the examination and answer any questions you may have before getting started. When preparing for the exam, please wear comfortable, loose-fitting clothing. If you are having an MRI examination of the brain, please avoid make-up, excessive hair spray and gel, and hair extensions. 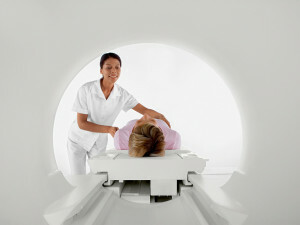 MRI examinations vary in length of time, depending on the scope of the test. You may be asked to change into scrubs or a gown for your examination. -First, the technologist will place you on a padded table that is positioned in the center of the MRI machine on the area to be scanned. -Then, during the examination, you will hear a faint knocking sound, which represents a change in the scanner’s magnetic field. -While the MRI examination proceeds, the technologist will observe you at all times. An intercom system is built into the imaging system so that you can communicate with the technologist throughout the exam. Our board-certified radiologist(s), with advanced training in MRI, will interpret the exam and provide a written report to your physician. Your physician will then contact you to discuss the results of the examination.